Details about 2009 Star Trek Movie Command Collection Sulu 12" Action Figure! Character Family: Star Trek Size: 12in. This Hikaru Sulu Collectible Figure from the Playmates Toys Command Collection is a must-have item for the serious fan. The swordfighting helmsman is an integral part of Kirk's command crew. 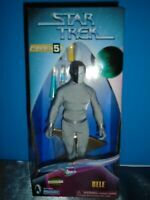 This figure is lifelike and fully articulated, and he is posed on a Starfleet display stand. His uniform is made from real fabric, with the utmost attention paid to style and detail. Package dimensions: 14H x 4D x 8W. Weight: 18 oz.